Networking is the process of establishing relationships with people who can directly or indirectly assist you in finding a suitable job. Networking helps you to successfully uncover opportunities in the “Hidden Job Market” – jobs that are not advertised or otherwise announced. 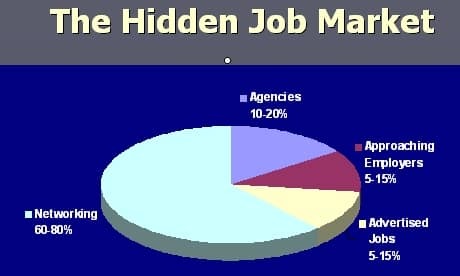 Did you know that between 60 to 80% OF ALL JOBS ARE NEVER ADVERTISED? They are secured as a result of networking in the hidden job market. – Information interviews (where you contact a prospective employer to learn more about the organization). Your contacts can help you best when you are clear about what you are seeking and what you have to offer.